Website last updated April 2019, details below. This website is an introduction to The Victor, The Hornet and now The Hotspur (picture) comics published in Great Britain for boys (and any girls who were interested) by D.C. Thomson. Celebrating three great British Boys comics packed with adventure, war, humorous and sports stories. 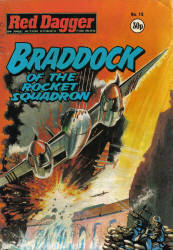 Featuring Captain Neilson : The Man in the Mine, The Bombs with the Purple Stripe, Alf Tupper - The Tough of the Track, (from The Victor); Inspector Jim Ransom (The Big Palooka) and The Limping Man (from The Hornet); King Cobra and Zigimar, the Master Spy (from The Hotspur) and many, many other wonderful characters and strips! Are you reading the adventures of The Guard? Everyone else is! Want to read a slightly different type of comic which uses Lego mini-figures and buildings, cars and so on to create exciting and visual entertaining stories? Well, why not try out my own humble crime fighting comic. The Guard, this month - story No. 67 - Interlude. Please click on the the Guard banner below, to be taken to this month's Guard story. A good starting point for new (or indeed frequent) visitors would be to visit the following page Victor 50th anniversary page. This page provides a timeline of the Victor comic as well as links to other pages on this site, including the Victor and Hornet indexes and series review pages. Also on this site readers can read interviews with some of the creators who worked on the comics, including the Victor editor, James Halley and Keith Shone, artist; reviews of comic strips, including several episodes of the reviewed strip (one hundred and thirty-six reviews available to read as of December 2015); Victor, Hornet and Hotspur indexes which are updated regularly; a page about the artists (thirty-seven listed as of December 2014); articles about both comics and much, much more. This site is updated monthly. If you wish to contact me please use the link further down this page. Please note all images on this site unless otherwise stated are copyright of D.C. Thomson & Co. Ltd . Please click on the images below to be taken to this month's update page. During 2013 I commissioned Keith Page to draw the above British comic Thomson character The Black Rider for this website. Page has worked in the British comics industry for many years. Those of you who read the Commando booklets will know the name and his work. Page has also worked on other projects such as the Iron Moon and a Bryant and May story. Both are graphic novels. His blog can be read by clicking on the following link - Keith Page. My thanks to Keith for the drawing. To go to the previous months updates, please scroll on down the page. Links to other pages on this website can be found below. The Victor Summer Special page. Below are links to other pages of interest on this website. And click on the image below to be taken to this month's special feature. In early 2012 I commissioned Leigh Gallagher comic book artist (Defoe, Aquila and Judge Dredd for the British comic 2000AD) to draw for me a Victor Hornet Comics fifth anniversary drawing. Needless to say he came up trumps! Trying to choose ten characters for Leigh to draw wasn't easy. I wanted characters that were there in the early days of the Victor, as well as newer characters in the latter half of the comic's life. Then the characters chosen needed to represent every major genre and also some characters from the Hornet comic. A tall order! In the event I only left the western genre out. But I'm very happy with the result. Thank you Leigh. For further information about Leigh Gallagher and his work please click on the link. His blog is updated regularly, with news of what he's working on and he also has pages of his artwork for sale. Further information about the characters in the picture above can be found via the Victor and Hornet series review buttons below. Editorial Ramblings - January 2018. January 2018 is the tenth anniversary of this website on the web. In that ten years, over one hundred and fifty Victor, Hornet and Hotspur comic strips have been posted, along with interviews with various editorial staff, writers and artists, articles about The Victor, including a timeline and indexes for all three comics. The Victor index is almost complete, the Hornet index is partially indexed and the Hotspur (second series) index has been started, but still needs a lot of work! So I think that's a good ten years well spent. Here's to the next ten years. Fingers crossed! D.C. Thomson for allowing me to use images from The Victor, The Hornet and Hotspur comics, York College for their 'Build a website course', Dan Courtis for helping out with technical details, Vic Whittle, James and Joyce Halley, Keith Shone, Roddie Watt, Calum Laird, Bill Graham, Anna Pichora of the Library and Archives Canada, Alex Vella, Jamie Stripe, Lyn Flanders, Ron Smith, Arthur Tabone, Bill Moodie, Jeremy Briggs, Steve Holland, Ray Moore, Jim Croasdale, Derek Marsden, Chris Barnett, Andy Longley, Chris Fitzsimons, Paul Sutherland, Susan O'Connor, Leigh Gallagher, Craig Farrugia, and Antony Harding. If I have missed anyone out, my apologies. Sadly, no new Victor annual for 2017. But you may still find the three Victor reprint annuals available to buy. See details below. From the Amazon.co.uk website, "The Tough of the Track was The Victor's most popular hero, having instilled the competitive spirit into millions of British lads for over 50 years. A welder who worked under railway arches, Alf Tupper survived on a diet of fish and chips. He was always the underdog, running against posh toffs who devised underhand ways of keeping him off the winner's rostrum. Although Alf often looked beaten, he nearly always came through in the final few strides, exclaiming "I've run him!" as he breasted the winning tape in a photo-finish. Published in the year the Olympic Games returns to Britain, this nostalgic anthology will not only be the perfect gift for the millions of men whose love of sport was kindled in their youth by Alf Tupper, but will also enthrall and inspire a new generation of boys to go and win against all the odds." The Tupper stories featured are those from the early Victor annuals. Blooming ada, only £12.99, what a bargin! Order your copy today. Above left is an image of the the front cover of the new 2012 Alf Tupper annual and on the right the 2010 and 2011 annuals. Do you enjoy a good war story in pictures? Then why not try a Commando war booklet? Now in its 54th year, Commando is a 64 page, black and white picture comic, slightly smaller than A5 in size. Eight issues are published each month (of which four issues are reprints). Four issues are on sale every fortnight and can be found at all major W.H. Smith stores. (But not at all Smith railway station stores for some reason). Each issue tells a war story usually from the First or Second World Wars, although adventures from other centuries and wars are also told. Below are two cracking Commando booklet covers. Cover artwork on the left by Ian Kennedy and on the right by Keith Page. Please click on the below image to be taken to the Commando website. The flags below represent the nationalities of those who worked on The Victor and The Hornet whether they were editorial staff, writers or artists. The comics may have been British as regards the stories that were published and in design and style, but the European and South American artists also gave them an international flavour. The Help for Heroes website is a U.K. charity devoted to raising money for wounded British Armed Forces personnel. If you would like to help please visit their website shop where you can buy a mug, items of clothing and other items, make a donation or help to raise money. The website also has details of how the money raised by the charity is used or will be used in assisting those personnel wounded in action. (I can recommend their very handsome bone china mugs and other items. The charity also has many other good quality and smart items for sale). Below are the last twelve previous# monthly site updates. Other series reviews can be found on the Victor, Hornet and Hotspur review pages, accessible via the relevant page buttons above. As this site grows viewers will be able to read a brief history of both comics, working biographies and interviews of some of the artists, writers and editorial staff. James Halley editor of The Victor, an editorial assistant for The Hornet, Bill Graham and artist Keith Shone have been interviewed so far. Please click on the radio microphone link button in the left hand column. I have begun compiling a Victor index and a Hornet index (click on the appropriate 'index button' to the left), which will eventually list all of the stories, characters, artists and so on that have appeared in the weekly comic, annuals and summer specials. The index will be compiled in an A to Z arrangement of characters, writers, artists and story subject headings. For example, World War Two stories. If anyone wants to know when a certain strip started or when a particular character appeared in the The Victor or The Hornet and it is not listed in either index, please contact me (via the e-mail address below) and I will do my best to help. For those wishing to learn more about various strips, reviews will be provided. This will serve as an introduction for those who have never encountered the characters before and for those who wish to re-acquaint themselves with the various strips. One complete episode from the pages of The Victor or The Hornet is also provided with each review for your enjoyment. To access these reviews please click on the links running down the left hand side of this page. Conservation of comics is something that affects all comic collectors. A small section devoted to this subject will explain why comics become brittle and tips on how to conserve your precious comics. Finally, your help is required. Much information about British comics in general has been lost or not saved for future generations. In this part of the website you will find examples of artists work which I have not so far been able to identify. Artists who's work has been identified can also be found here, along with any other information about them. Any information about the writers of the various strips is also required. If anyone can help please contact me via my e-mail address. Please enjoy your time browsing this website. What is meant by the term comic book? Will Eisner (pronounced Isner, the 'E' is silent), is regarded as one of the great masters of comic book art and one of the earliest comic book creators. Eisner started working as a cartoonist in the 1930's. His most famous cartoon strip is the The Spirit, which was syndicated in newspapers world-wide for a dozen years. His theories of comics and sequential art were incorporated in his scripting and drawing of The Spirit strip. Many of his ideas were formed whilst working under great pressure in the production of a seven page weekly comic! Eisner then worked in producing a monthly technical manual using the comics medium for the United States Army for over two decades. In 1978 Eisner wrote and drew the pioneering graphic novel A Contract with God and since then several other graphic novels. Eisner died in 2005. Will Eisner's Comics and Sequential Art definies the term as, 'When one examines a comic book feature as a whole, the deployment of its unique elements takes on the characteristic of a language. Comics communicate in a 'language' that relies on a visual experience common to both creator and audience. The format of the comic book presents a montage of both word and image, and the reader is thus required to exercise both visual and verbal interpretive skills.